After the success of our first workshop in Vancouver, which focused on analytical techniques and applications in geochemistry, we knew we wanted to try something different. 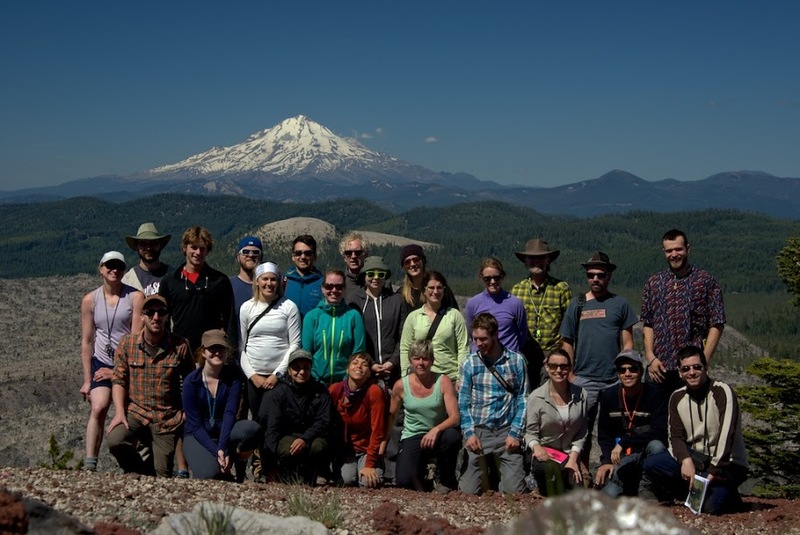 This year, we hit the road for hands-on geology and volcanology training in the unparalleled natural laboratory of California (June 14-21, 2014). We were a large and diverse group – 25 participants from the undergraduate to postdoctoral level, plus staff and faculty – from McGill, University of Toronto, Université du Québec à Chicoutimi and UBC. Some of the trainees had met in Vancouver but there were many new faces to welcome. The first field site was the 16 x 32 km Long Valley caldera east of the central Sierra Nevada Range, which formed as a result of the catastrophic Bishop Tuff “super eruption” about 760,000 years ago. We started with a gondola ride up to the top of Mammoth Mountain (3370 m), a lava dome complex with stunning views of the entire expanse of the caldera, to give participants an overview of the main features and sense of scale. In the afternoon, we visited the Lower Rock Creek canyon, Bishop pumice quarry and Owens River gorge where we saw various expressions of the Bishop Tuff (welded to non-welded, proximal to distal), including pumice fall and pyroclastic flow deposits, and features such as fiamme, columnar jointing and rosettes. We ended the day getting lost but eventually found the highway (it would not have been a geology field trip without some off-roading!). Day 2 began with a visit to Earthquake Fault, a 20 m deep fissure that opened 550-650 years ago during a period of intense volcanic activity, followed by a look at the Hot Creek flow, a 288 ka rhyolite lava flow with great examples of spherulites. Later we spent some time at Mono Lake to investigate the tufa towers, calcareous deposits that formed when calcium in freshwater springs combined with carbonate in the saline lakewater. A hike up Panum Crater, with its well-preserved ejecta ring and central dome, gave us a chance to see banded obsidian and “breadcrust” bombs. After a much-needed ice cream break, we finished the day with a quick stop to look at rafted pumice blocks. The third morning, we took a shuttle to Devil’s Postpile, a spectacular display of columnar jointed basalt. 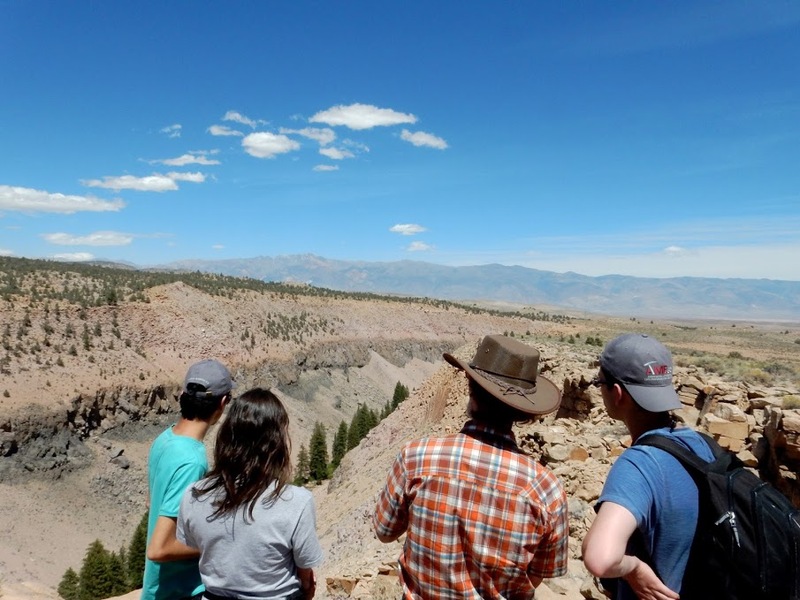 The rest of the day was spent learning more about the Inyo craters, a chain of silicic lava domes similar to the northern-lying Mono craters seen the previous day. At Obsidian Dome we examined obsidian that was highly vesicular, where gas-rich magma from the interior of the flow has been squeezed up to the surface. The day concluded with the final project presentation of MAGNET trainee Kalina Malowany at Glass Creek Dome, where classic “marble cake” magma mixing textures can be found. Kalina explained the mineralogy and geochemistry of the two magmas, which supports derivation from different magmatic systems and subsequent interaction along interconnecting dikes just prior to eruption. Next we headed 8 hours north to our second field site, the highlands of the Medicine Lake shield volcano, the largest in the Cascade Range. We exchanged the relative luxury of our condos in Long Valley for tents and sleeping bags, complete with communal dinners, stargazing, campfire songs and marshmallow roasting. We camped at the shore of Medicine Lake, nestled within the volcano’s broad 7 x 12 km summit caldera. Day 1 was devoted to comparing and contrasting several silicic lava flows. A few hours were spent climbing over the pressure ridges atop the expansive, multi-lobed Glass Mountain obsidian flow, which is zoned from rhyolite to dacite. Glass Mountain formed only ~950 years ago and is the youngest lava flow at Medicine Lake. After lunch we had another final project presentation by MAGNET trainee Tom Ver Hoeve, who provided a review of magma mixing processes and outlined the textural and chemical evidence for magma mixing at Glass Mountain. While hunting for good examples of magma mingling and xenoliths, we discovered spectacular banded black and red (oxidized) obsidian known as tuffisite. 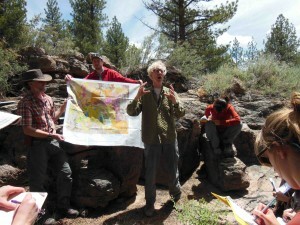 Next we visited the more crystal-rich obsidian at the Little Glass Mountain and Medicine Lake glass flows. On the second day, we first checked out the plagioclase-rich Lake Basalt directly behind our campsite before going up to the top of the Little Mt. Hoffman cinder cone for panoramic views of Mt. Shasta and Lassen Peak – the perfect spot for an overview of the Cascade Arc. On the way to the Paint Pot basaltic andesite, we hiked up an old logging road and dug out blocks of the Antelope Well dacite, a partly welded tuff ejected during the ~180 ka caldera-forming eruption. After lunch we explored two of the many vents that erupted basaltic lava during the Giant Crater event at ~10.6 ka. At Chimney Crater, basalt draining back into the crater formed a smooth coating on the crater rim. With the hot sun beating down on us, we walked over part of the ~45 km long Giant Crater lava flow, where we saw collapsed lava tubes, skylights, lava channels, and ropy lavas. Inside Giant Crater we met a very friendly deer and discovered centimeter-scale plagioclase megacrysts in the basalt, possible evidence for crustal contamination. At the end of this long, hot day, everyone (yes everyone!) cooled off with a refreshing jump in the lake. On the final day, we went to the Burnt Lava andesitic flow and High Hole Crater, a well-preserved cinder cone. We climbed atop a banked lava channel and discovered a “mother lode” of partly fused granitoid inclusions. 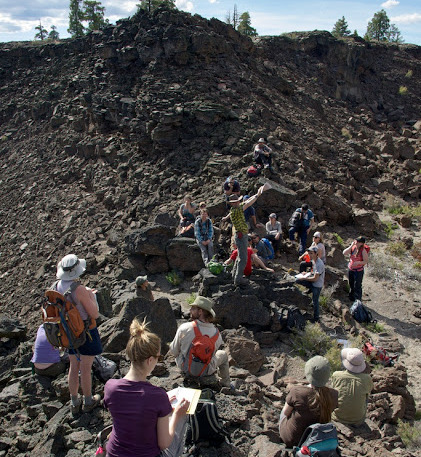 On the eastern flank of the volcano we examined the Tionesta high-alumina tholeiitic basalt, which represents the parental magma for other Medicine Lake lavas and has been used in classic experimental studies on the phase equilibria of basalts. 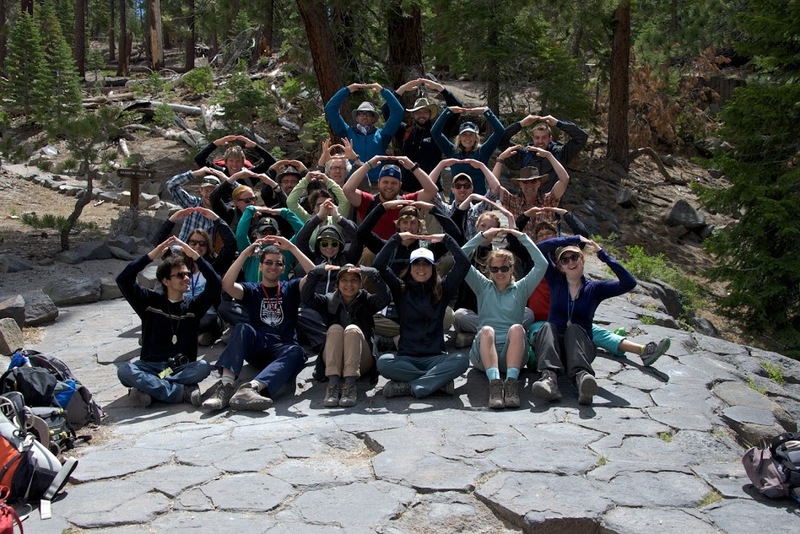 After a screening test and gear decontamination (to protect the bats from white-nose syndrome) the group descended into the Upper Sentinel lava cave. We saw lava cascades, lavacicles dripping from the ceilings and broad lava benches recording high-stand levels. Then it was time to say goodbye – it was a moving experience to see the friendships and bonds that had been created during the week. The field workshop was a huge success, both scientifically and personally for everyone involved, and was another important milestone for the MAGNET program. 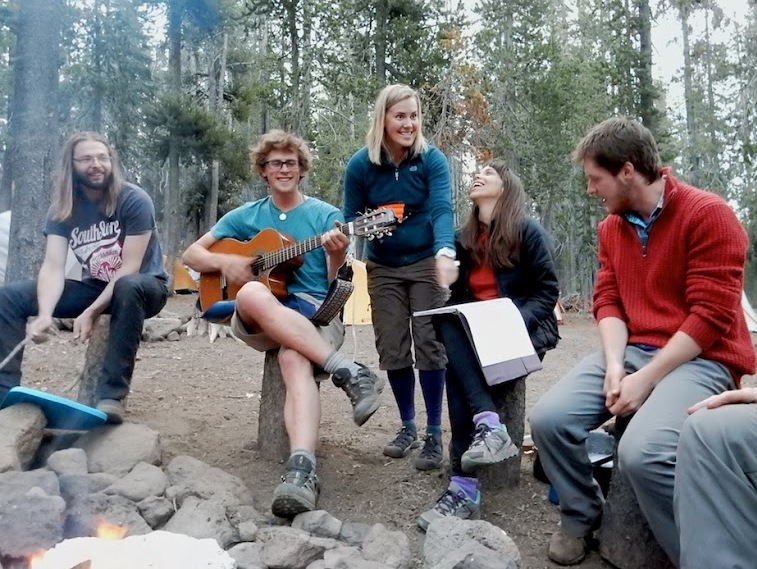 The trainees are already looking forward to next year’s workshop, which will have yet a different theme, this time low-temperature geochemistry!